Gen Xtinct: Classic Clip Monday: Pebbles and Bamm-Bamm Sing! We've featured a lot of earworms on this site ("Come On Eileen," we're talking to you), but get ready for one of the most earwormy: the episode of the Flintsones where Pebbles and Bamm-Bamm sing "Open Up Your Heart (and Let the Sun Shine In)." The episode's a fun one, with the kids getting so famous, they hit the top of the Billboard charts, play Carnegie Hall and start hanging out in the Viper Room (OK, not that last one). Spoiler alert: It all turns out to be a dream. The song didn't originate on the 'Stones, of course: "Open Up Your Heart" was originally recorded by singing cowboy Stuart Hamblen and his family in 1954 as The Cowboy Church Sunday School. 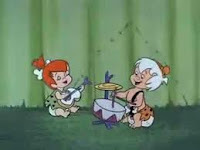 But man, did Pebbles and Bamm-Bamm's rendition jam it into our generation's ears. Here's a clip from the show, and also the original song from Cowboy Church Sunday School. If you're particularly sensitive to earworms and thinking about playing either one of these, here's a piece of advice: Yabba Dabba Don't. I'm impressed by all the available channels Fred has to flip through.